The New York City Fire Museum is located in the former quarters of FDNY Engine Company No. 30, a renovated 1904 fire house at 278 Spring Street between Varick and Hudson Streets in the Hudson Square neighborhood of Manhattan, New York City. The museum cares for over 10,000 objects as well as an archive of records, ephemera and photographs estimated in the tens of thousands of pieces celebrating the history of the fire service and the New York City Fire Department. Examples of modern day firefighting equipment are also on permanent display at the museum as well as a permanent memorial to the 343 members of the FDNY-EMS lost at the World Trade Center on September 11, 2001. The FDNY's original museum opened as the Fire College Museum in Long Island City in 1934. In 1959 the collection was moved to the spare bay of a working firehouse at 100 Duane Street in Manhattan, where it remained until the Home Insurance Company presented its own extensive collection of fire memorabilia to the city in 1981, making a move to larger space imperative. A new non-profit, The Friends of the New York City Fire Department Collection, was created to raise funds to renovate the former quarters of Engine Company No. 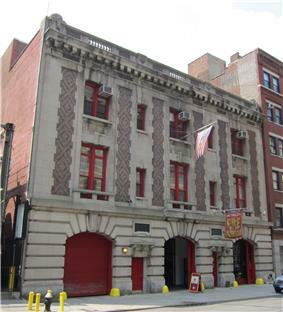 30, a 1904 Beaux-Arts firehouse on Spring Street, and in 1987, the New York City Fire Museum opened to the public. 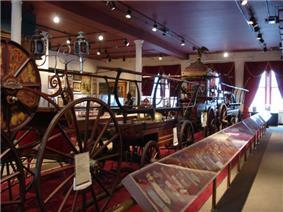 Exhibits in the museum demonstrate the changes in firefighting practices from bucket brigades to carriages to engines. The evolution of the department itself, from volunteer firefighters to municipal fire departments is also covered. The museum also houses a special memorial to the 343 members of the FDNY who lost their lives in the September 11 attacks. This memorial includes artifacts recovered from the World Trade Center site, as well as a monument commemorating each firefighter who made the Supreme Sacrifice. Retired FDNY firefighters are often on hand to educate the public on firefighting history as well as to relate personal anecdotes. The museum is also very active in fire safety and prevention education and has a mock apartment highlighting fire hazards for its kindergarten though 12th-grade programs. The New York City Fire Museum attracts approximately 40,000 visitors a year. Attendance at the museum spiked to 46,000 visitors in 2002 following the September 11th attacks and has since leveled off. The New York City Fire Museum tells the story of the early days of firefighting in New York City. 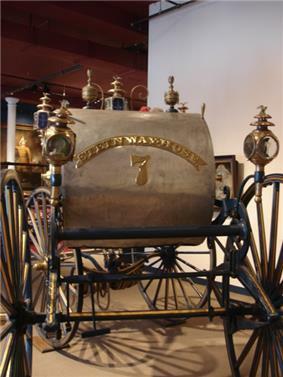 The collection is home to firefighting artifacts and equipment dating back to the 1650s, such as carriages, engines, fire marks, buckets, trumpets, helmets, lanterns, rattles, and uniforms. Permanent exhibitions include: Firefighting on Parade, Romance of Firefighting, Fire Apparatus, and Tools and Uniforms. The museum also has an extensive collection of fire insurance marks. ^ "About Our Museum". New York City Fire Museum. Retrieved May 23, 2012. ^ "Fire museum traffic falls after 9/11 spike.". New York Times. Feb 15, 2004. p. N29. Retrieved May 22, 2012. ^ a b "Permanent Exhibitions". New York City Fire Museum. Retrieved May 23, 2012.